The Earth has been torn into two parts by an irreversible division. Whether due to nature, or the unknown depths of the mind itself, everyone is now either Human or Hater. Victim or killer. Governments have fallen, command structures have collapsed, and relationships have crumbled. Major cities have become refugee camps where human survivors cower together in fear. Amidst this indiscriminate carnage, Danny McCoyne is on a mission to find his daughter Ellis, convinced that her shared Hater condition means her allegiance is to people like him. Free of inhibitions, unrestricted by memories of peace, and driven by instinct, children are pure Haters, and may well define the future of the Hater race. But, as McCoyne makes his way into the heart of human territory, an incident on the battlefield sets in place an unexpected chain of events, forcing him to question everything he believes he knows about the new order that has arisen, and the dynamic of the Hate itself. Besides the interesting story behind the publication of David Moody’s “Hater”, a novel initially published online by the author and which caught the attention of Guillermo del Toro and of the publishers, the novel brings a fresh approach to the apocalyptic scenario usually seen in the zombie fiction. But “Hater” is also the first novel in a trilogy and David Moody follows the natural course with the second novel in his series, “Dog Blood”. In “Hater” our society is brought on the brink of collapse following a series of unknown events, shattering human relationships and families in a violent manner and splitting humans in two. Danny McCoyne is one such man, turned into a Hater, he is separated from his family, but especially from his daughter who is a Hater too. In “Dog Blood”, Danny McCoyne begins a quest of finding and reuniting him with his daughter. As such Danny McCoyne is pretty much the sole character of the novel, or at least the major appearance within “Dog Blood”. Everything that happens within the story is seen and judged through Danny McCoyne’s perspective, “Dog Blood” being told from the first person perspective, and therefore everything is related to Danny’s feelings. Although the first person perspective can be tricky David Moody manages to create a powerful character, the way Danny experiences and rationalizes the events around him giving his presence consistency. The way he shows his feelings turn him into a character whose motivations I can fully understand, sympathetic being a bit too much to say in the given situation. We can also easily see the emotional changes that Danny suffers, because those emotions are reflected by the way the story is told. It is easy to spot his calmness from the flowing and steady phrases or his agitation from the short and almost barked sentences. Danny also helps the reader to see the way the world was affected by this change. “Dog Blood”, as well as its prequel “Hater”, works with an apocalyptic scenario usually seen in the zombie fiction, only that David Moody comes with a fresh approach. In the end that proves to be even more powerful, because after all humans are capable of more terrifying actions than any dead returned to life. David Moody masterfully depicts a world that is collapsing on its own. All over the novel’s pages a bleak and overwhelming atmosphere can be felt. The society tries to cope with the change it suffered, but finds itself unable to do so. Every missing service, that otherwise can be named indistinctive at best, helps the situation turn into a nightmarish one. 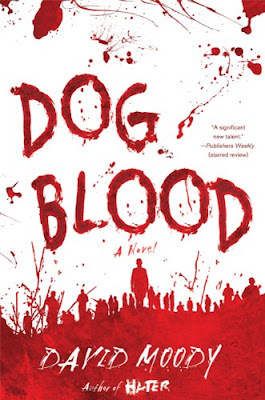 “Dog Blood” is far from being a perfect novel, there are aspects that didn’t sit entirely well with me, but that also can chase away some of the readers. It is very true that “Dog Blood” can be classified as a horror novel, but I have to say that the amount of gore is a bit excessive. More than its prequel, “Hater”, the present novel is action packed, but also an ultra-violent and blood-soaked one. And if it wasn’t for the good story and the way David Moody delivered it the amount of head bashing of every single solid surface would have driven me away for this book. There is also a stereotypical presence within the Danny McCoyne’s thoughts and on a couple of minor characters. They think at their existence before the change suffered by the known society a few times too many and every time not in the complimentary way. Another thing in “Dog Blood” is that David Moody introduces a group with varied particularities within the Haters, the Brutes, and although I might have a guess for their presence and the future role they’ll play, they appear only occasionally and without an obvious significance for the story. David Moody set for himself high standards with “Hater” and he successfully rises to those standards with “Dog Blood”. And since nothing from “Dog Blood” hints of the conclusion of David Moody’s trilogy we can only wait and see if the final volume will be as pleasantly surprising as the first two novels of the series were.